Feb 20, 2006 by meabbott Click photo for LARGE size. Click photo for LARGE size. Monday I was buying a Red Bull when someone asked me about the walking stick I use. It's a bit of a personal question, but instead of bopping them sharply with my stick, I answered. "It's from a car accident." "Oh," they said. "I thought you might be a veteran. This being Veteran's Day and all." "I'm a vet," I replied. "United States Army, U.S. Army Reserve. I was a medic and a flight paramedic. Rotary wing. Helicopters. And ground ambulance. Jeeps, really." And with that, we were off to the races. We talked probably ten - fifteen minutes. The war, the military, what being a medic is really like, presidential politics, we were all over the place. It was fun. Somewhere in the middle we touched just for 20-30 seconds on President Bush and moved right on by without stopping. I said, without even thinking about it, "Oh, he's in Washington today. It's Veteran's Day. The Commander-in-Chief lays a wreath at the Tomb of the Unknown Soldier." Like a father visiting his son's grave, or a commander visiting the burial site of one of his fallen soldiers, laying the wreath at the Tomb of the Unknowns is a sacred, solemn obligation. Even now, writing this, I am shell-shocked at the very thought any President would ever fail to carry out his duty. 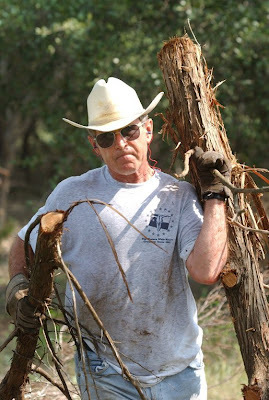 Final Jeopardy Answer: This U.S. President was famous for his lack of empathy. Unlike his Presidential father, alone out of every U.S. President he refused to attend even one funeral for the thousands of U.S. military men and women killed in wars under his command. Your Final Jeopardy Question: Who is _________________? One of my friends was a Tomb Guard. I've watched him stand Guard Mount, march the 21 steps in front of the Tomb, wait the 21 seconds, make his turn, wait, march, and so on. 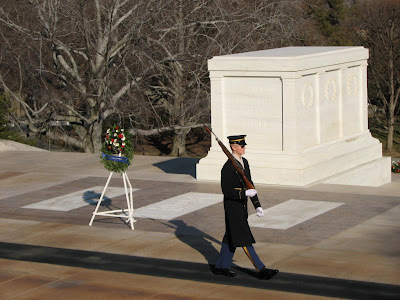 The Tomb of the Unknowns is a sacred, holy space. All of Arlington is sacred space. My jump master who put me out my first five jumps, is buried in Arlington soil after a jump accident on the Ft. Campbell main drop zone I'm come in on so many times. I've visited his grave, and I've jumped in his memory. I know precisely where my jump log is in my bedroom right now, with his name and jump ranking signed off on my jumps. I've knelt on his grave and prayed. I've stood in front of the Unknowns and held the sharpest, hardest salute I know how as tears streamed down my face and I weep as I write this. Sara, as you know, lives in Canada. Canada is a peaceful country, with a rich awareness of their veterans. 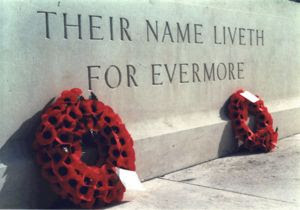 At Orcinus, Sara writes of Canada's Remembrance Day. I'll start you out here, then jump over there and finish up. And it's a show worth showing up for. Brass and bagpipe bands march. The Mounties turn out in their scarlet coats. Old men stand a bit straighter in their regimental coats and kilts, their chests full of medals, to receive their nation's honor once again. Brilliant red poppies bloom on the lapel of every dark coat as the poem "In Flanders Fields" (written by Canadian officer John McCrae, and inscribed in the memory of every Canadian schoolchild) is read aloud. Families come together, and go out for lunch after. Every civic group and church comes forward to present a wreath in memory of Canada's fallen soldiers, in a procession that can last well into the afternoon and ends with enormous piles of greenery and poppies banking the monument. And at 11:00 sharp, the entire country -- in streets, in stores, everywhere -- comes to a dead halt, observing a full minute of national silence honoring the moment that the Armistice began, and World War I came to an end. They know how to honor their veterans in Canada. We used to know how to honor veterans, here in the United States. In Crawford, there sits a craven coward, a man who yesterday gave a six minute speech in which he repeatedly evoked terror, 9/11, killing them over there so we won't have to kill them over here, the sacrifices these four families have made and how proud the are of their children (when who knows how these families of the dead actually feel), a coming attack on our nation which will be much worse than 9/11, and much, much more. I'm frankly shocked President Bush didn't throw armed atomic hand grenades down the aisles while shouting "The Iranians are coming! The Iranians are coming! They're trying to nuke us all. Run, run, run for your lives!!! Ruuuuunnnnnnn!!!!!!" Bush was, according to the LA Times, going to make an actual political speech attacking the Democrats in the presence of four grieving families. But he didn't. Cut his speech short. So at least there's that. When ever I think there is nothing left George Bush can not desecrate, can not damage even given hundreds of years of American history... I am shocked yet again. At this point, I literally would not be too surprised were the President or Vice President of the United States to literally use the actual U.S. Constitution to wipe their asses. The President dishonored the Unknown Soldiers. Every soldier who has ever fought, served, bled, risked their life in peace time and in war, has been shamed by this impostor who sits with the launch codes and claims to be our Commander-in-Chief. As fast as this spreads, the military'll have no respect left at all. None. He may get some orders obeyed. But his ability to do anything major is done.